At our company many of us enjoy going to the movies just a much as anyone and recently we really enjoyed the latest movie from Marvel titled “Captain America: Winter Soldier”. As some of us were watching certain parts of the movie (like Nick Fury versus the Police Armored Car Chase), while wildly entertaining, failed to explain what happens in real life when a real armored car is attacked. For those that haven’t seen the movie there is a scene where Nick Fury is driving around in what appears to be an armored Chevy Suburban (see video clip below), he is quickly attacked by imitating police offers. We wanted to discuss some misconceptions about the scene and what actually happens in real-life when under attack. What we try and do with our bullet proof cars is give our clients time to get out of a bad situation. In the Hollywood version, Nick Fury’s car appears to have standard glass in all the windows. He is attacked heavily and no shots enter the car; giving the impression that this is a heavily protected vehicle. There is no way that glass at a couple 3mm or less thick could stop multiple impacts from AK-47s, AR-15s, shotguns, handguns, hammers and everything else you see in the scene. At International Armoring our glass starts at 20mm to stop handguns and can go all the way to 70mm thick (like “The Beast”) to stop armor piercing rounds. Anything less and you be lucky to stop the smallest of handguns. We pride ourselves on using the lightest armor in the industry, but still have aramid fibers and other armors inside the cavity of the doors and all other locations to absorb the rounds that are coming at the vehicle. Similar to a glove catching a baseball,our armor slows down and catches the bullets; protecting the passengers inside and disappointing the would be assailants. From the chase scene, you can clearly see there is no armor protection surrounding the doors and other vital areas. Majority of films will show that bullets just bounce off or barely indent the armor. In real-life, the doors would absorb the armor rounds or dissipate the bullet completely. Fury’s vehicle takes dozens of rounds, but not one tire is ever blown out. Even with our runflat rollers included with our armored vehicles, the tires would blow out and rely on the inserted plastic rim inside. These run flats allow the driver to continually drive for upwards of 60 miles at 60 mph, allowing you to get out of a dangerous situation. If only technology was advanced enough to inform drivers of the status of their armor integrity in an attack. Unfortunately, this is not available yet (or is it – see our Smart Truck Video), but we do offer several options that can be found in movies ala James Bond to Clear and Present Danger. These include smoke screens, electric shocking handles, ram bumpers, and tack dispensers to name a few. Used as defensive measures, they can help you escape an oncoming attacker. 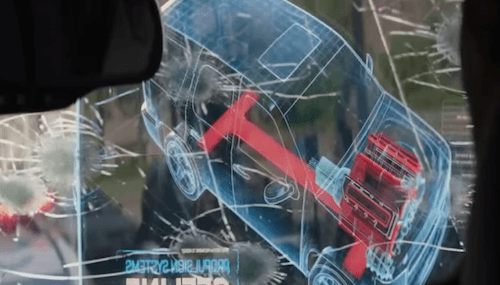 While not necessarily shown in this clip (as the glass was already weak), it is never a good idea to shoot from the inside of a ballistic vehicle. Curved glass is currently designed to be one directional and can cause harm to those inside at such a close range. And while there are ballistic glass products out there where you can shoot from the inside our primary purpose is protecting the individual inside and allowing them to get back to their families. This is why we recommend focusing all of your effort on getting out of the situation instead of trying to fight back. 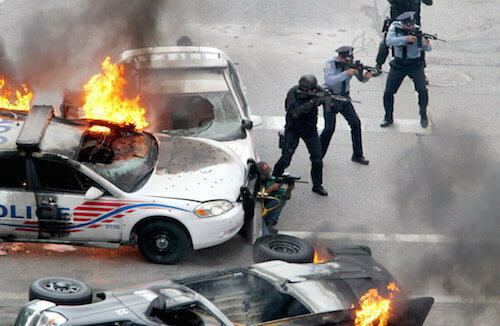 Armored cars are built to provide a time buffer to get out of the area. This is when light weight armor is vital to the escape, as maneuverability and speed are greatly improved. What ever your protection needs may be, please give us a call @ +801-393-1075 to discuss.